The need of the bereaved to visit the “Devastated Areas” and to seek out, if possible, the grave of their relative, became obvious almost as soon as the Armistice was signed. For those venturing into France or Flanders during the first years of peace, the experience could be a heartrending one. The concentration cemeteries, bringing together large number of battlefield burials, were only in an early transitional stage (right) and the exhumation parties were still busy on their task of searching every inch of the battlegrounds. The Pilgrimage movement had an impetus all of its own, however, which could not be stopped by government appeals to wait until things were more organised. But even for an individual it was relatively easy to get to somewhere like Ypres. The traveller could leave Victoria Station in London at 8.45 am and be at Ypres by 8.17pm at a cost of £1 2s 11d [£1.15] single. Once there, there would be no shortage of entrepreneurs anxious to help at a price. For example half a mile down the Dickebush road a former British officer ran a recommended garage and hired out cars at two francs the kilometre. Private enterprise was not the answer for vast numbers of people, though, with private travel bureaus charging as much as £35 for a visit to Loos. 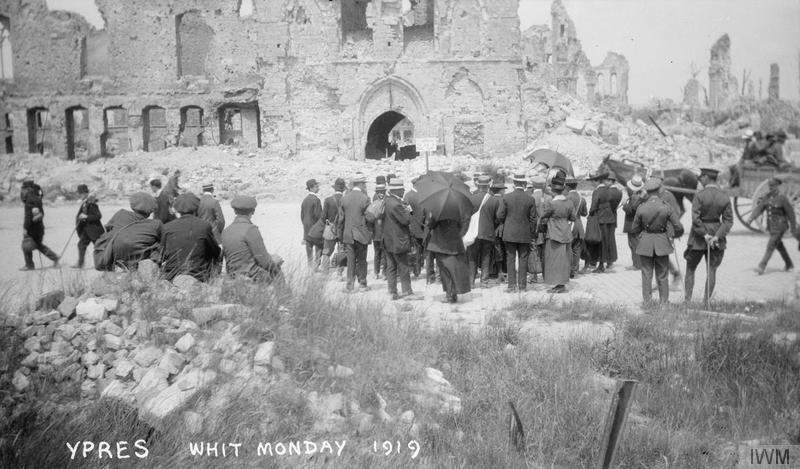 By 1920 the YMCA was running an inclusive £6 tour of the Somme field; organisations like the Church Army, British Legion, Red Cross and Ypres League followed suit. It was the St. Barnabas Society, though, which soon became the most important organisation arranging subsidised pilgrimages from Britain for those too poor to visit the war graves at their own expense. Named after the saint of consolation the organisation had been founded in 1919 by an Anglican Clergyman, the Rev M. Mullineaux. Those who made such journeys, emotionally and physically difficult, were able to do so in the company of others like them, who knew what it meant to mourn fallen soldiers. These subsidised pilgrimages were devoid of comfort and luxury. There were no lights in the train, one veteran recalled, just travellers sitting up all night in the dark on wooden benches, talking about the war. All pilgrims were met at Calais by a St.Barnabas ‘lady worker’. They were taken to the cemetery by car, then back to a small hotel in time for their return to England the following day. 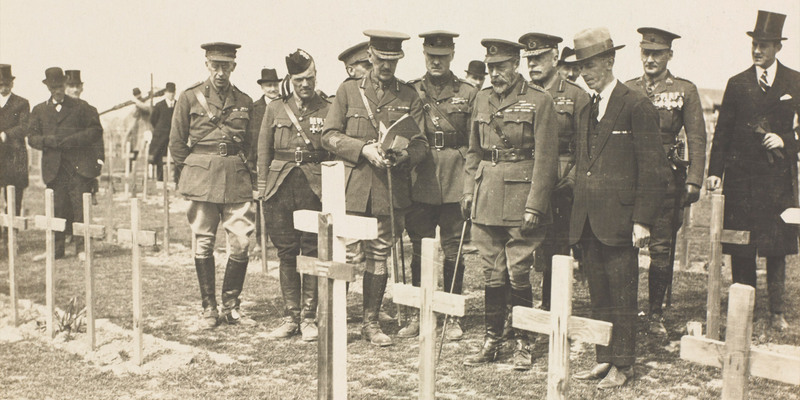 In May 1922, King George V made his own pilgrimage (above) to the half-finished cemeteries of France and Flanders. At the huge cemetery at Etaples (right), he took an envelope from his pocket and asked one of the gardeners to direct him to a particular grave. A book called The King’s Pilgrimage sold in huge numbers; it included a poem by Rudyard Kipling still grieving over the loss (without trace) of his son John at Loos in 1915. The number of visitors to the cemeteries and battlefields increased throughout the 1920s. 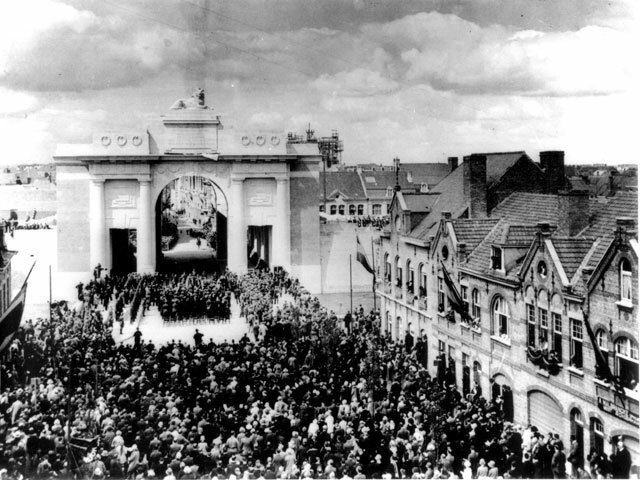 In July 1927, just ten years after the horrors of Passchendaele, Lord Plumer opened the Menin Gate of Ypres, a memorial to those whose bodies had not been found. “He is not missing; he is here” was Plumer’s message, transmitted by radio back to England. If there had been any notion that the pilgrimages would begin to ease off as the years went by, the number of visitors at the Menin Gate told a different story. During July and August 1928 23,000 visitors signed the visitors book there. In 1937 more than 60,000 people went to see it. By then of course, another war was looming. In 1922 King George V had expressed the hope that “the existence of these visible memorials will, eventually, serve to draw all peoples together in sanity and self-control.” A vain hope, seemingly.